or to download a self-contained e-book, click on this link - Save Joseph_the_Huron.exe to your hard drive and click to open e-book. Windows 9*, 2000, XP only. ...my "dot-com" Home Page, that is. I am very pleased to meet you, even in this long-distance way. You probably have tapped into my website because you know I am an author. Perhaps you've read my newspaper column, seen me in a guest appearance. Maybe you're here by a chance - a random link clicked on after turning up in a search. However you happened by, a resounding THANK-YOU to all who have tapped into my website to learn more about me and my books. I have called her "A Determined Woman—Worker for The Lord," but that doesn't begin to say what her story really is. I spent the better part of ten years interviewing the Lady Abbess and writing what would be her definitive biography. I was honored, because she chose me to be her biographer, truly a very special enterprise, especially as I got to know her story from birth to nearly her mid-90's. 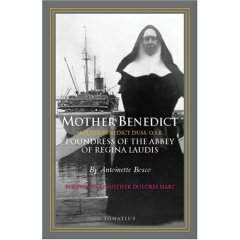 Yet, after some three versions of the book were completed, Mother Benedict determined the biography should not be published in her lifetime. Then a few days after her death in 1995, an editor from Ignatius Press called Mother Dolores Hart, the former actress who entered this monastery at the height of her acting career in 1963, and asked if they had anything in writing about the Lady Abbess. She answered, "Do we!! We have a whole book." I truly believe that Mother Benedict was somehow "behind" this request, having determined that now, having reached her place in Heaven, the book should be published. Thanks for giving me the opportunity to introduce myself. I hope you will want to read on!